Wood heat is inexpensive and wonderful – but requires hands-on attention. Conventional heat (gas or electric) is push-button convenient – but is more expensive to operate. Our gas and electric heaters sit outside the tub so you get "full circle" seating inside. Our wood-fired heater sits inside the tub. It reduces seating capacity by about one person. Tub height: a four foot tub of a given diameter holds about the same amount of water as a three foot tub that is a foot larger in diameter. For example, a 6' diameter x 3' deep tub holds approximately the same amount of water as a 5' diameter x 4' deep tub. While both have the same amount of water to heat, the larger diameter, shallower tub holds more people and allows more useful "lounging room." The Snorkel® Stove is standard in our 6', 7', and 8' diameter tubs. The smaller Scuba® stove is used in our 5' tubs. The corrosion-proof aluminum stoves' large surface area transfers heat fast. And wood heat is economical: burn anything from lumber scraps to hardwood. Some customers want the aesthetic beauty of the all-wood Snorkel® Hot Tub...but with push-button convenience. We offer excellent gas and electric heating systems, each equipped with 2-speed jet systems: high speed for hydrotherapy and low speed for filtration and heating. (Jet systems and simple filtration systems are also available for our wood burning hot tubs.) See Power Pak Details for more information. Choose the diameter by the number of people who'll usually use your tub. You can always squeeze in more"tubbers" on occasion. Note: the bigger the tub, the more heat required. To get a true idea of size, cut a 5', 6', or 7' circle out of a large piece of cardboard or make one out of rope. Most people choose our 3' high tubs. Water depth is 31", same height as most sofa backs, so you can lounge comfortably. 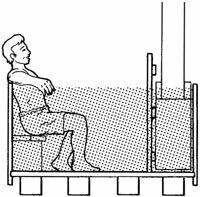 Our 4' high tubs (43" water depth) hold nearly 40% more water – very useful for water exercise, perhaps a necessity for those 6' 3" and taller – but more water takes longer to heat and the extra depth requires those of average height to sit more upright rather than lounge. CUSTOM sizes, too. Call for details. Once you've chosen tub size and heat source, it's time to customize your Snorkel® Hot Tub. We offer a wide variety of tub covers, steps and stairs, benches, and "extras” including drain kits, hoses, stainless steel stove pipe, stainless steel tub hoops, and much more. All our accessories are described in detail on the following pages. Snorkel® or Scuba Stove depending on tub diameter. Pressure-treated 4” x 6” chime joists (supports), 3, 4, or 5 depending on tub diameter. ORDER EARLY to get even more! Standards with which tubs 5" diameter 6" and 7" diam. Heat transfer surface 13 sq. ft. 22 sq. ft.